Laxmi Mardi shares her experience of losing her mother, Parvati Mardi to Silicosis in 2012. Silicosis, an irreversible lung disease caused by prolonged exposure to fine silica dust, has become well-known as an occupational disease since the start of the industrial revolution. Twenty years since signing on to the ILO/WHO International Program on Global Elimination of Silicosis, India has made no progress on this front. While posters citing our right to a safe a healthy work environment are commonplace in offices in the USA, this is an uncommon subject in India. The Occupational Safety and Health Association of Jharkhand is trying to change that. Terenga is a small village near Jamshedpur, Jharkhand, barely 40 km from the city but a world away in real terms. In the late 1990’s, K. K. Minerals opened a quartz crushing factory here, bringing the villagers a welcome alternative to the cyclical and unreliable nature of farm labor. 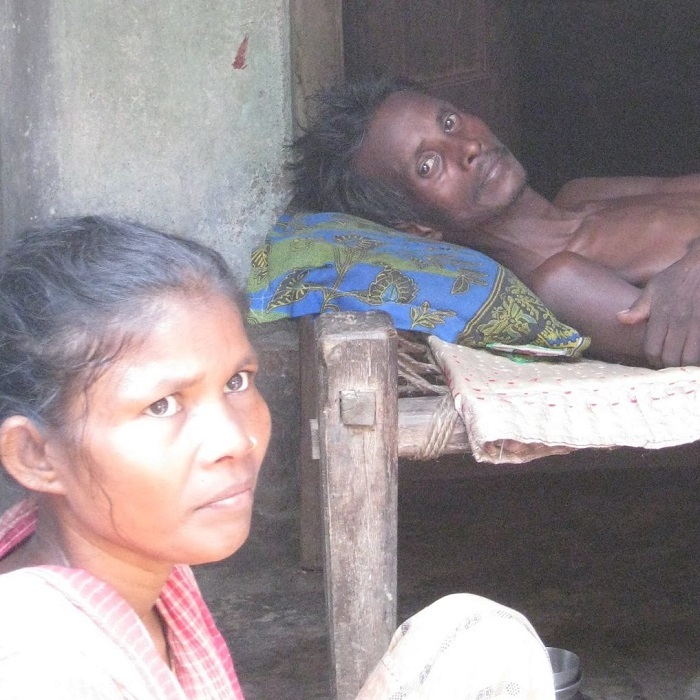 By the early 2000s, villagers working in the factory were suffering from a debilitating lung disease, with many dying. Today Terenga has a lane where nearly every house has seen death due to Silicosis – a disease that all villagers are now acquainted with. Angry villagers forced the factory to shut but only to reopen a few kilometers away, and worryingly their story is being repeated in another village. 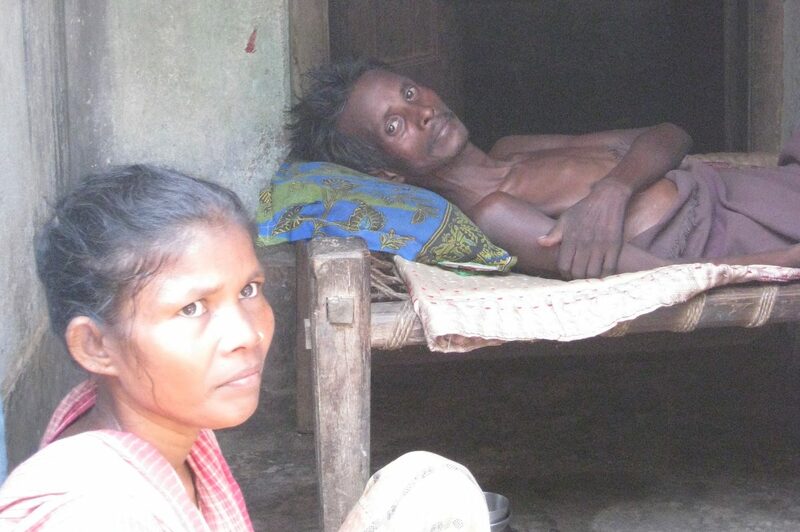 Sriram Munda, weak and bedridden due to silicosis. His wife attends at his bedside. 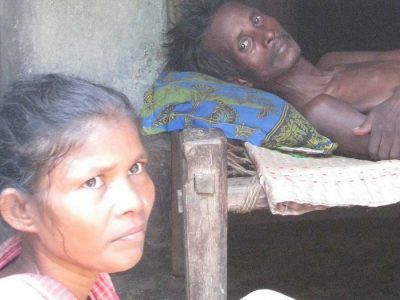 Weakened and bed-ridden due to the effects of Silicosis, with his wife Laxmi, in 2013. His neighbors in Musaboni were familiar with his symptoms and observed that once the disease progresses to this stage he was unlikely to recover. Troubled by the high incidence of respiratory diseases among poor workers in the mining areas of Jharkhand, and the apathy towards their plight, Shri Samit Kumar Carr formed the Occupational Safety and Health Association of Jharkhand (OSHAJ) in 2003 along with a devoted group of volunteers that included family members of Silicosis victims, lawyers and doctors specializing in respiratory diseases. Today the organization is active in several villages in Jharkhand, West Bengal and Orissa, tackling the many faces of this serious issue. Monica Gope, who lost her husband to silicosis, talks to residents of Terenga village and asks them to attend silicosis awareness workshop. Several Silicosis victims and their family members directly link OSHAJ to the affected communities, helping spread awareness and mobilizing local support. 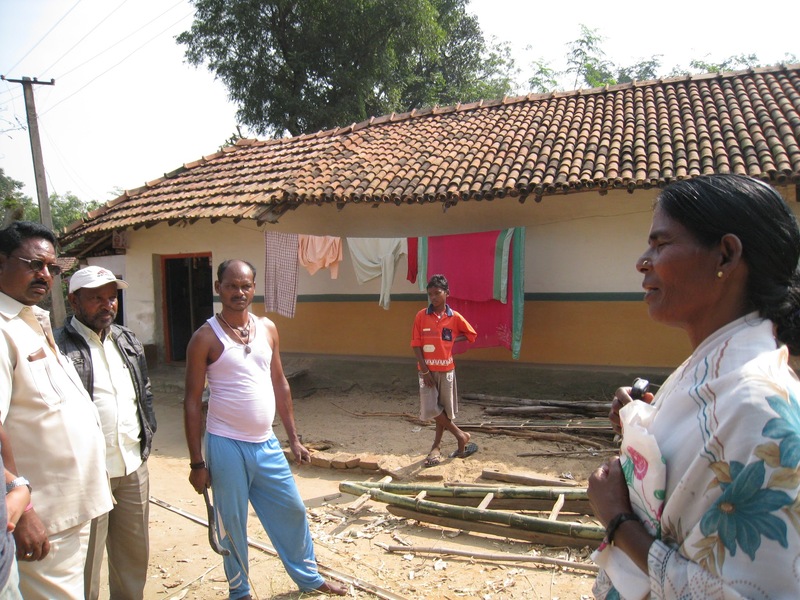 Monica Gope lost her husband to Silicosis in 2005.Here she is seen urging residents of Terenga village to attend a workshop organized by OSHAJ in Jamshedpur. Lacking support from local authorities and government hospitals, OSHAJ facilitates medical examinations for individuals with the help of volunteer specialist doctors. OSHAJ also maintains records of medical and employment history of affected workers. RTI applications and these medical records are crucial when OSHAJ approaches the courts or the National Human Rights Commission to seek relief for Silicosis victims from private employers or the government. OSHAJ organizes workshops, conducts publicity campaigns, and publishes articles in regional and national newspapers to raise awareness about Silicosis. Here Dr. Tapan Kumar Mohanty speaks at one such workshop organized by OSHAJ in Jamshedpur. Dr. Mohanty is a chest specialist who volunteers his services for diagnosis and treatment of several Silicosis victims in Musaboni. The loss of a bread-earner due to Silicosis has a lasting impact on families, particularly young children. OSHAJ provides direct and indirect support to many families. Nineteen year old Laxmi Mardi lost her mother to Silicosis and was left to provide for herself and her younger siblings. She shared her experiences at this OSHAJ workshop in Jamshedpur. Read on to know more about her story. Thirty-two year old Parvati Mardi died on 2nd November, 2012, after a long painful battle with Silicosis – an irreversible lung disease acquired after seven or eight years of working in hazardous conditions at K. K. Minerals. Her young daughter Laxmi stepped early into adulthood, spending the last six months of her mother’s life by her bedside in a Jamshedpur hospital when she should have been attending high-school. 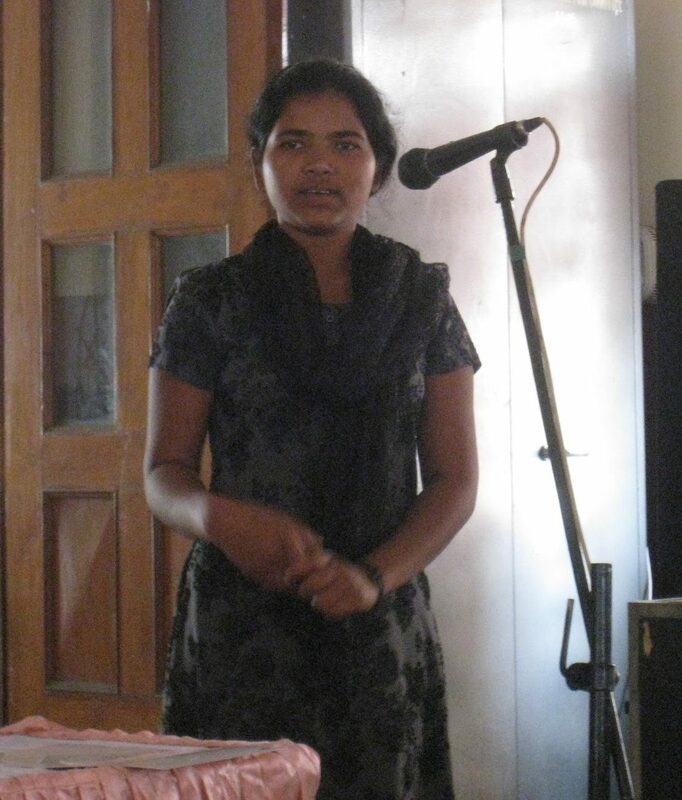 She related her story at a workshop for Silicosis victims and their advocates in Jamshedpur on 24th November, 2013. Here are excerpts from what she had to say, translated from Hindi. Since my mother started working at the quartz factory, she first kept losing weight, then her whole body started turning black. She looked very weak and thin and had difficulty walking, lifting heavy things, or washing clothes. She could not do any work that required energy. The chest specialist at the hospital, told me that Mummy’s lungs had become completely defective. There were small small holes in her lungs from dust accumulation. He told me that I should take her to a good hospital for better treatment. I knew that Mummy’s condition would not improve, but neither would he tell me directly, nor could I directly ask him about it. She had become so weak that even with a continuous supply of oxygen she had a lot of difficulty breathing. On 2nd November, 2012, Mummy’s condition was very serious. I requested the doctors and had her shifted to the ICU [Intensive Care Unit]. The doctors had me sign some papers. I was seventeen years old then. In the ICU Mummy died, and I felt very bad. Mother wanted all of us to study, and sacrificed her life for us. Now I want to study more and become self-dependent, and want to make my life and my younger brothers’ lives better. With a lot of help from this organization [OSHAJ], this year  I completed my ISC (class XII), which I earlier had to abandon due to my mother’s illness. Even though I cannot take so much responsibility on myself that I could help everyone, I will definitely remain attached to this organization. We cannot stop these industries on our own because they are powerful. At the same time, everyone works for food, so we cannot stop people from working. Roti [food] is the biggest thing, and here we go through a lot of struggles for livelihood. But I want that no other children have to bear the difficulties we have gone through. I dont want them to remain uneducated because of which they too will have to work in a crusher like my mother had to. Through the efforts of Shri Samit Kumar Carr, her personal champion and OSHAJ General Secretary, in September 2014 Laxmi enrolled in a four-year B.Sc. Nursing program at Metas Adventist College in Ranchi, Jharkhand. She will receive a stipend from the government and her education expenses will be covered by a tribal cultural project supported by the Tata Steel Tribal Cultural Society.